Would you not like to protect your property by strengthening your fencing or boundaries but without affecting its appearance adversely by using inferior quality wires or glass shards? Would you not prefer if there was a solution to prevent intrusion without hurting a human or animal? Well, we have an incredible solution to all your problems and you will love it for its many incredible features and benefits: ABCOSPORT FENCE AND WALL SPIKES -Comes in a set of 10 x 48.8 cm anti-climb security spikes -Made up of high-strength polypropylene material for high durability and superior protection -Weather Resistant Design -Protects your perimeter without affecting the appearance of your property adversely -Helps prevent human intruders, animals or even birds -Ideal for use on fences, walls, gates, sheds, railings, ledges etc. -Helps you protect your property while staying in compliance with anti-climb security laws which discourage hurting anyone 100% RISK-FREE SATISFACTION GUARANTEE We also offer you 100% risk-free satisfaction guarantee to let you buy with confidence; no questions asked. So, why think twice? ORDER NOW and Get These Incredible Anti-Climb Security Spikes Delivered to you in Just 5-6 Days. ANTI-CLIMB SECURITY SPIKES - Effective perimeter security takes a new form - no more yards of shards set into concrete or sharp barbed wires or razor wires to hurt an animal or even human, rather an effective method of preventing them from climbing over a boundary wall or crossing a line. Abcosport anti-climb security spikes help prevent human intruders, cats, dogs or other Big animals. VERSATILE - Our anti-climb security spikes are safe for use on fences, walls, gates, sheds, railings, ledges etc. There is an Anti-Climb Spikes law that discourages use of anything that can injure anyone - and these spikes which are perfect for preventing anyone from intruding without hurting provide an ideal means to comply with the law yet prevent your valuable property. SUPERIOR QUALITY WEATHER RESISTANT MATERIAL - Our anti-climb security spikes are made up of high-quality robust propylene plastic which makes them highly durable. The spikes are also weather resistant and do not get corroded unlike the metallic spikes - making them the best choice for your perimeter security needs. 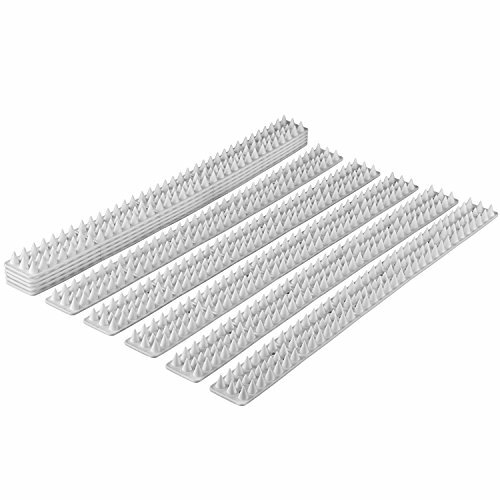 PERFECT SET - The spikes come in a set of 10 x 48.8 cms spikes, adding to a total length of 4.8 meters, which is ideal for covering a wall. The small pieces could also be separately used for covering different areas as each piece could be independently used without depending on the other. 100% RISK-FREE SATISFACTION GUARANTEE - We also offer you 100% risk-free satisfaction guarantee to let you buy with confidence; no questions asked. However, we are quite sure that you will love this innovative approach of protecting your property from intruders without hurting them. More importantly, why hurt a naïve bird or animal when you just want to prevent intrusion.